A perpetuum mobile is a an object that generates more energy than it consumes, thus remaining in perpetual motion as well as creating repercussive motion in objects with which it comes into contact. The event score is a four-dimensional ready-made which ‘‘scores’’ fragments of reality and acts as a perceptual as well as performative instruction. 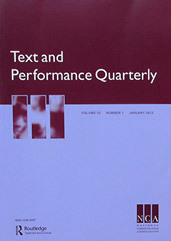 This article examines the event score’s grammatical, that is to say pro-gramming, relationship-forming function and argues that it is on account of its open-ended, multi-player interactional structure, its power to ‘hail’ participants, and its durable temporal working, that the event score generates perpetual performance and triggers cross-categorial ways of being and acting in the world.